Even though I blog about cooking, I really don’t like making big elaborate lunches. When I made pasta for myself two weeks ago, that was kind of a huge deal to me. I made pasta–for lunch! So I’ve been seeking out some easy, seasonal lunch ideas and I just happened to find a good one on Panini Happy: Granola-Crusted Pear and Almond Butter Panini. Being lazy about lunches, I didn’t do the granola-crusting (and I know I’m missing out, I’m sure of it! ), but the pear and almond butter on a sandwich was delicious! One of my favorite fall snacks is pear slices topped with a little bit of cheese, so I decided that this would make a good sandwich too. And thus the Pear & Sharp Cheddar Grilled Cheese Sandwich was born! Oh fine, I’m sure other people have done it many times before, but it’s new to me. Since I’m forever counting calories, I used only an ounce of cheese on each sandwich so it’s not one of those super gooey oozy grilled cheeses that get so much love on Pinterest. But I’m okay with that. Y’all can put more cheese on the sandwich if that’s how you do. 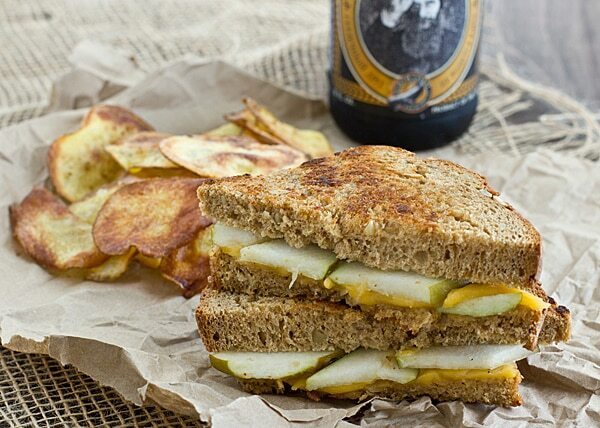 Pears, cheddar cheese, and a good hearty bread–hello, fall lunch! Heat a griddle or skillet on medium-high heat. Butter two slices of bread on one side; place buttered side down onto the skillet. 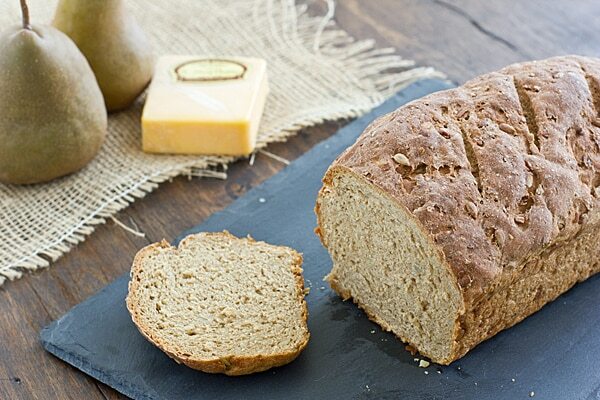 Top bread with pear slices and cheese–put a little cheese on the bread first, then the pears, then the remaining cheese. Butter remaining bread slices and place them on top of the sandwiches, butter side up. Cook until bottom of sandwich is browned, 3-5 minutes. Flip over and cook 3-5 minutes more. This is an example of sweet and savory and it’s easy to make and pleasant to taste and eat. I used ripe bartlett pears.